"These easy, beautiful, yummy sandwiches are perfect for brunches, tea parties or spring and summer lunches. Can be prepared ahead of time and assembled just before serving. This is an easy appetizer to prepare the day before, except for the assembly. The cream cheese mixture is actually better after about 8 hours. Feel free to experiment with the dressing; we prefer the buttermilk dressing but ranch or Italian works great, too. Also, cocktail bread can be substituted for the hand-cut bread, which will save 10 to 15 minutes." Mix cream cheese, sour cream, mayonnaise, ranch dressing mix, and dried dill in a bowl until creamy and smooth. Cut crusts from bread slices; cut sliced bread into decorative shapes (such as rounds or flowers) with cookie cutters. 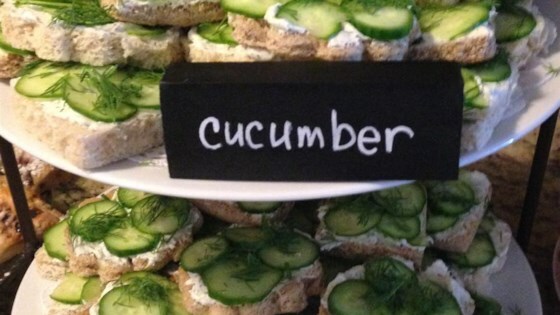 Spread each piece of bread with cream cheese mixture and top with a cucumber slice. Top each canape with a few fresh dill leaves. Try these game-day ready ham and cheese sliders. Very tasty and simple to make. I was pleased when I made a trial batch. It's also good with plain cream cheese. I will be making 100 of these for a ladies tea party. Loved it! fast and easy to make yet taste as if it took hours to make! I brought these to a baby shower and they were great! They were all gone and only had an empty plate to take home. Very easy and simple to make.